Important: don’t add the standard e-commerce events from here if you use WooCommerce or Easy Digital Downloads. They are automatically configured by the plugin. 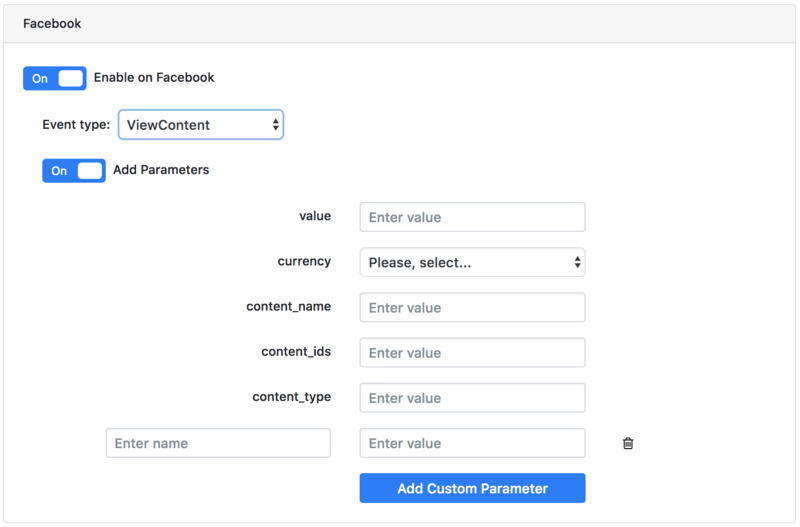 Facebook, Google Analytics, and Pinterest have all a set of standard events, but you can also configure your own events (custom events). Each event can be fired on one or more networks. In order to configure events, open PixelYourSite Dashboard and click on the Events tab. Once inside, click on the blue “Add” button. Give your event a relevant name. It’s used for internal purposes and is visible only to you. You can add multiple similar triggers. The “Page visited” trigger supports a delay in seconds. When “contains” is selected, any URL that contains the string will fire the event. If “match” is used, only the exact URL will fire the event. The event can be configured for one or multiple networks: Facebook, Google Analytics or Pinterest (via free add-on). Each network will have its own set of “standard events”, but you can also define your own custom events. Turn ON the “Enable on Facebook” switcher. Select the event type. You have a list with the Facebook standard events, but you can also define your own custom event. Standard events can be used directly for ads optimization and ads reports. They can also be used for Custom Audiences and Custom Conversions. Custom events can’t be used directly for ads optimization or ads reports and you’ll need to create a Custom Conversion first. Once you have it, it will be available for both tasks. Custom events can be used for Custom Audiences. Turn ON the “Add Parameters” switcher. For standard events, you will have the most common set of parameters already configured. They are not mandatory and you can also add your own parameters. Custom events have no pre-defined parameters, but you can add your own according to your needs. Turn ON the “Enable on Google Analytics” switcher. For “action” you can select one of the standard names, or use your own. Non-interactive: events with this value set to “true” will not count against the bouncing rate. To make an event non-interactive, the switch must be ON. Turn ON the “Enable on Pinterest” switcher. Select the event type. You have a list with the Pinterest standard events, but you can also a “custom” event or a partner-defined event. Custom: use this event name to track a special event that you want to include in your conversion reporting. Partner defined: add any additional event that you’ve defined for the purpose of audience targeting. The standard and the custom events can be used for conversion reporting and to create custom audiences. Partner defined events can be used only for custom audiences. Turn ON the “Add Parameters” switcher. For each event, you can add any parameters you consider necessary. Once you are done, click the “Save Event” button.